We're open Monday-Friday 7:30 am until 11pm (midnight on Fridays). 8am-midnight on Saturdays, 8am to 11pm Sundays. Our Croscombe Stores micro-shop is now open too, 8am to 6pm, Mon-Sat, 9am-11am Sundays. See detailed opening hours here. Please telephone us! Call 01749 342306 for reservations or enquiries. If it's not urgent you can also use email. There’s been a friendly welcome at the George Inn for over 350 years. The George is our award-winning 17th century family-owned freehouse in the scenic village of Croscombe, between England’s smallest city of Wells and Shepton Mallet, Somerset. Find us on Google here. The George is a traditional pub is where everyone can mix in: where stories are told, the world put to rights, opinions aired, follies endured; hunger fed, thirst quenched, bodies rested, the mind stretched and your soul refreshed. We love giving a friendly welcome, serving superb pub food, providing unique and exclusive-to-our-pub local ales and ciders, making your bed and breakfast accommodation comfortable and creating great experiences for everyone. We welcome everyone: individuals, families, the disabled, walkers, hikers, workers, bikers, and especially dogs. We host many regular and occasional events and provide for functions, birthdays, anniversaries, weddings, wakes, and special occasions. Be prepared to enjoy the sights, sounds, smells, tastes and touch of an authentic village public house, where we’re all family for a while. The Good Pub guide awarded us “New Pub of the Year ” in 2008, and we have been listed in the Guide’s Top 10 UK Landlords nearly every year since then. The CAMRA Good Beer Guide has listed us since 2004 and we have won the Bath and Borders Branch “Pub of the Year” three times — most recently in 2016. Trip Advisor awards us their Certificate of Excellence and we intend that you will too. We’re here to make your visit brilliant and we look forward to providing you with good drink, great food, comfortable accommodation and always a friendly welcome! Our house beers, King George the Thirst and George and the Dragon, are produced just eight miles away; and our ciders come from even closer, with “Stones Dry” produced only two miles down the road! Freshly prepared good food is a pub favourite — Here is our Steak & Ale pie, perhaps the most popular traditional meal. Our team makes homemade food sourced locally from traditional, organic and fresh ingredients, even using produce from our own garden or the farms and fields around us. We’re renowned for our fresh fish from Devon and Cornwall, and for our local pheasant, partridge and venison when in season. Taste the difference! 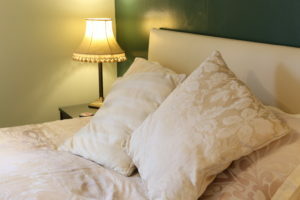 We are pleased to offer four ensuite rooms, decorated comfortably and uniquely. Please check availability in the sidebar, see the rooms here and email or call us to book (01749 342306).